One of the most timeless of all of the themes is the Tea Party. With so many variations, it is easy to see why this party never ceases to enchant. Bursting with elegance and charm, this event is destined for the scrapbook. If you had a little girl in your life, a Wonderland party might be a perfect choice. With some serious woodland fashion, an enchanted Tea Party Birthday couldn't be more delightful. 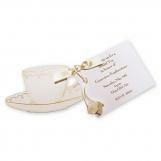 This lovely party can be adorned with shimmering gold accents. Add in bright floral prints. Abstract patterns in black and white. Then finish things off with simple moss and green velvet to add extra lush. Top it all off with cute mini crowns. Don't forget, you can create tiny thrones for the little guests to become the Queens of hearts for the afternoon. 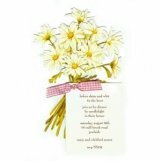 As always, start things off by designing your invitation and party favor stickers. Use this as your party palette. Imagine royal blue, light pink, olive green, with pops of birch bark and sparkly gold color accessories. The invitation will simply stun your guests. Carrying the elements from the invitation throughout the party makes everything stay cohesive. When your guests arrive, greet them with a favorite portrait of the guest of honor. Hang it on or by the front door with a sumptuous green ribbon. Each child can be offered a precious gold crown. Have a grown-up dressed up just right. This person can be in charge of placing the crown upon their heads as they enter. Imagine how special they will feel as then enter your wonderful tea party. Pulling off the perfect tea party theme simply needs clusters of dainty details. If the party is for an adult, include an assortment of vintage teacups, cake plates. Use tea tins to top fancy cakes, pies, and cupcakes. Consider going with a Shabby Chic Garden Tea Party. The tables can be filled with lush flowers and fancy foliage. This will make your guests feel transported to a secret garden. Order stickers to add to your favors. Assemble teacup favor bags and you've got the perfect reminder that 'love is brewing'. Take the party outdoors. Create a rustic venue with the use of any brick walls you may have. Add a shabby chic door or some vintage shutters. It's surprising what you can find at salvage yards. Then add a floral wreath with a banner. Use ruffled curtains or antique quilts for your table decor. The use of your garden can create something out of a dream. Add some rusty relics to make the perfect backdrop for a beautiful tea party. Why not host a tea party to celebrate the arrival of spring? A tea party for your friends is so easy to plan. All you need is cupcakes or bundts, tea and perhaps some champagne. Select one of our more modern prints to celebrate spring. Make from scratch layered cake or set of your signature treats. Then add in a few more sweet treats from the grocery store to keep things simple. To keep it modern, add a mix of the pom poms and honeycomb paper decorations hanging above the table. Mixing the paper with floral vases will make it feel fresh. Tea for two? No thank you, make your next tea party tea for your entire tribe!